Seattle University’s Championship Field occupies about half of the space that YMCA Park took. This is looking northwest from the corner of 14th and Jefferson. This is Championship Field, the soccer field for Seattle University. We’re looking northwest from near the corner of 14th and Jefferson. In September 1895 a new athletic field opened here in the two big blocks bound by Cherry, Jefferson, 12th and 14th. It was just east of the James Street Power House of the Union Trunk Line railway, which pulled a cable car from Pioneer Square and powered streetcars north and south on Broadway and to Madrona and Mount Baker. The park’s first major event was on September 2, 1895: Labor Day. After speeches, music, and events at Pioneer Square, everyone got on cable cars up James Street every one and a half minutes. Once there they participated in or observed many athletic competitions. On the track: sprint for boys under 15; sprint for men; broad jump; high jump; hop, step, jump; sprint for men over 200 pounds; sprint for girls under 15; and one-mile run for union members. On the field: hammer throw; three-legged race; shotput for union members; and broad jump for union members. And on bicycles: five classes of one-mile including the Puget Sound championship; one quarter-mile; one two-mile; and one five-mile race. For the winners there were prizes awarded by all of the big name stores in the city. 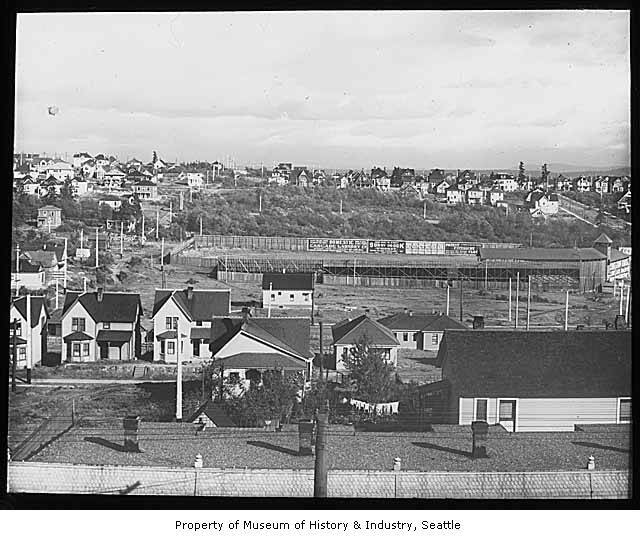 Photo of the field in the MOHAI collection, seen looking east from Broadway at the top of First Hill. Circa 1902. The athletic field hosted YMCA, Seattle Athletic Club, and University of Washington athletic meets of many types: football, track and field, baseball, and bicycle races. From 1896 it hosted professional baseball games and went by the new name “Athletic Park”, but the name Y.M.C.A Park or Y.M.C.A. Grounds still frequently appeared. The first professional baseball team was part of the New Pacific League in 1896. The Seattle PI coined the name Rainmakers for them after their visit to Portland was rained out two days in a row, causing financial hardship for the owners. 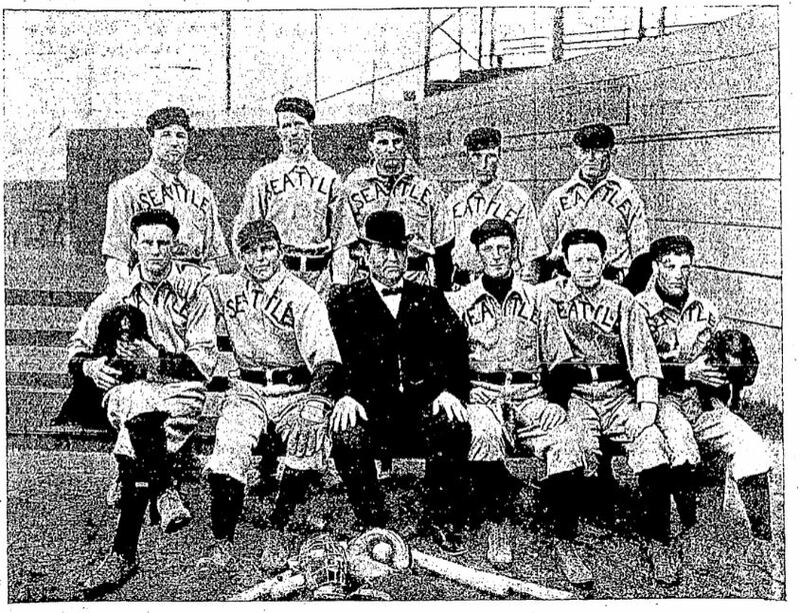 In March 1898 D. E. “Eddie” Dugdale entered the Seattle baseball scene as a player, coach and owner of a team in the new Pacific Northwest League that apparently had no name. The first game was in May in front of an audience of 425. Dugdale sold out his interest in July after the team lost too much money. Without him the team went on to win the pennant for that league as well as another for interleague championship against California League teams. Dugdale represented PNL in a proposed merger with California, which fell through. “Dugdale’s team”, the Pacific Northwest League Seattle squad. Seattle Times, May 3, 1901. In 1901 a new Pacific Northwest League team formed in Seattle, filling a league team gap since 1898. In preparation, Dugdale and the team owners invested in Athletic Park. Per the Seattle Times, “The diamond and bases are newly laid off and the turf put in the best possible condition. New seats have been added to the grandstands and better accommodations made to meet the great crowds…” (Seattle Times May 7, 1901). A partial review of newspaper articles from 1901 Seattle Times and Seattle PI shows no team name. It is referred to as “Dugdale’s team”. The team became known as the Seattle Clamdiggers in 1902. The Clamdiggers continued after YMCA Park was closed in 1903 and the Pacific Northwest League transformed into the Pacific National League. D. E. Dugdale owned or managed Seattle teams through 1919, and was actively involved in Seattle baseball through his death in 1934. Prior to Emil Sick he was far and away the most important figure in Seattle baseball history. The grounds saw a spectacle in 1897, called “Carnival of Madrid”, with ballet, singing, dancing, and a full fireworks display. A large field adjacent to the athletic park hosted at least once a Ringling Brothers circus in June 1899. The park closed in 1903. 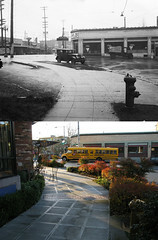 Although the private land was available for lease, the 13th Avenue street right of way was simply an unbuilt road. Hoping to improve access to their land, neighboring property owners successfully petitioned the city to complete the road in 1903. University of Washington had their own track by 1902, making it an easier pill to swallow. The Northwest League baseball team relocated to a new field at 5th and Republican, and a new Pacific Coast League baseball team located in Seattle in 1903 as well. 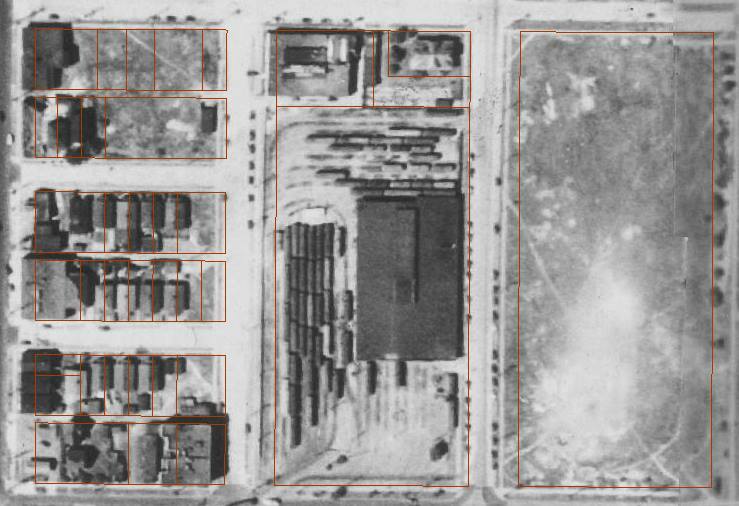 Half of the old field became a streetcar barn (overnight yard and repairs) for several decades. In 1997 Seattle University’s Championship Field opened, bridging a century of athletics. If you stumbled upon this article while comparing sources, you may find that my opening year for YMCA Park does not match other places on the Internet. Well, you and I are the beneficiaries of direct digital access to contemporary sources. That let me read about the 1895 Labor Day events in the Seattle Post-Intelligencer printed that morning. You can too.